Q: Can you please explain Water Resistance in detail? The water resistant quality of our timepieces comes in varying degrees, from non-water resistant to 20 BAR (ATM). Outlined below are examples of exposure to moisture as well as a description of the varying degrees of water resistance. A primary factor about water resistance to keep in mind is that it is not a permanent condition. When a piece is new, it meets the specifications for water resistance as indicated on the case back. However, as the watch ages, the gaskets which seal the watch become dry and brittle diminishing its water resistant quality. Exposure to environments such as chlorinated pools, salt water or soaps from showering can accelerate drying of the gaskets. We recommend that the gaskets be changed at least every 18 months to maintain the water resistant quality of your timepiece. 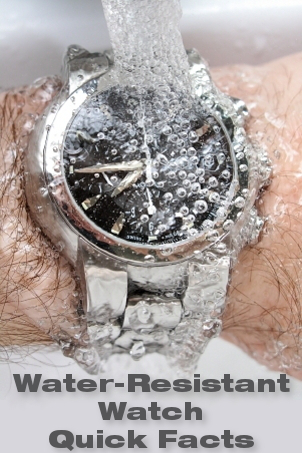 If the watch is exposed to chlorinated pools, soaps salt water, etc. on an occasional basis, we recommend that the gaskets be changed on a yearly basis. If the watch is exposed to the previously mentioned environments on a daily basis, we recommend the gaskets be changed every six months to insure the water resistant quality. Water resistance is measured at a static, or motionless state. As the watch is moved in water, such as from the motion of swimming, pressure is added from velocity. While you may be swimming in a pool at surface level, the watch may be experiencing forces equal to 3 BAR (ATM). Diving into a pool can cause pressures on the watch in excess of 3 BAR (ATM). 1 BAR (ATM) is equivalent to 33 feet of water pressure. Always allow a margin of safety when exposing your watch to moisture. You should never “push the limit” of the degree of water resistance. For example, if the case back of your watch states “Water Resistant to 10 ATM, you should only expose the watch to 7 or 8 ATM of pressure. This will allow a margin of safety and is especially important as the watch ages and the gaskets dry out. Be sure the crown is completely pushed in prior to any contact with moisture. If your model is equipped with a screw-down crown, be sure it is properly closed. Do not operate the crown or any push button when the watch is wet as this may allow the entrance of moisture. Q: How do I care for non-water resistant models? The case back has no indication of water resistance. This piece is not designed for contact with moisture at all. Great caution must be taken by the wearer to avoid any contact with moisture, such as when washing your hands or from a rain storm. If a non-water resistant model gets wet, immediately dry the piece and send it to the service center for immediate inspection. This will minimize any damage that may be caused by moisture. Q: What does “WR” mean when there is no depth designation after the WR? It means that the watch is designed to withstand accidental splashing only, such as from washing your hands or rain. Any submersion into water may result in the entrance of moisture. Be sure to immediately dry the watch after exposure to moisture.